Biomedical sensors are an essential tool in the detection and monitoring of a wide range of medical conditions from cancer to Parkinson’s disease. Biosensors for medical applications provides a comprehensive review of established, cutting edge and future trends in biomedical sensors and their applications. Part one focuses on key principles and transduction approaches, reviewing electrochemical, piezoelectric and nano-sized biosensors. Impedence interrogated affinity biosensors for medical applications and practical applications of enzyme biosensors are explored, before part two goes on to review specific medical applications. Biosensors for DNA and RNA detection and characterization, disease biomarker detection, and the use of affibodies as an alternative to antibodies in cancer marker biosensors are investigated, along with biosensors for drug testing and discovery, non-invasive measurements, and wearable biosensors for medical applications. 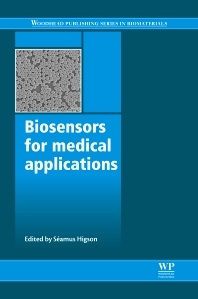 With its distinguished editor and international team of expert contributors, Biosensors for medical applications is an essential guide for all those involved in the research, design, production and use of medical biosensors. Seamus Higson is Professor of Bio- and Electro-analysis and Commercial Director of Cranfield Health at Cranfield University, UK. A member of the UK Engineering and Physical Sciences Research Council (EPSRC), Professor Higson serves in an advisory and/or consultative capacity for a number of public bodies, and has written extensively on a wide range of topics within the fields of medicine, biotechnology, materials science and health.